Here is the list of documents typically required for registration of a medical device in Russia. You are welcome to download this checklist in pdf format from slideshare. I hope it will help you with your Russian projects! Welcome to my monthly update, in which I share the latest news and updates on medical device regulations in Russia and countries of the Eurasian Economic Union (EEU). Here are my three highlights for October. 1. The Russian government approved the list of medical products subject to value-added tax exemption. In the first days of October 2015, the Russian government published resolution #1042 (link in Russian) and approved the list of medical products, which are not subject to value-added tax (VAT). The list consists of three parts: medical devices, optical devices and rehabilitation equipment. Resolution #1042 placed the period in long-lived contradictions between tax and customs legislation for medical devices in Russia. According to article 150 of the Russian Tax Code, imports of medical devices to Russia should be exempted from VAT. However, for several years this rule was a source of controversy for Russian customs, which imposed extra VAT (18% instead of 0%) in some cases due to new terminology for medical devices implemented by the Federal Law #323 in January 2013. Kazakhstan implemented new fees for the registration of medical devices. On 22 October 2015, the Ministry of Health of Kazakhstan enforced resolution #771 (link in Russian), implementing new rules for the calculation of fees for the expertise of medical devices for the state registration. New fees are provided for different classes of medical devices and are calculated based on safety class and number of modifications of the device or number of units in the kit in one submission. For example, the minimal fee provided for registration of a simple, low safety class medical device for dentistry is calculated as 48,000 KZT (about 170 USD) per unit; the highest fee of 515,000 KZT (about 2,000 USD) is provided for complex capital equipment. 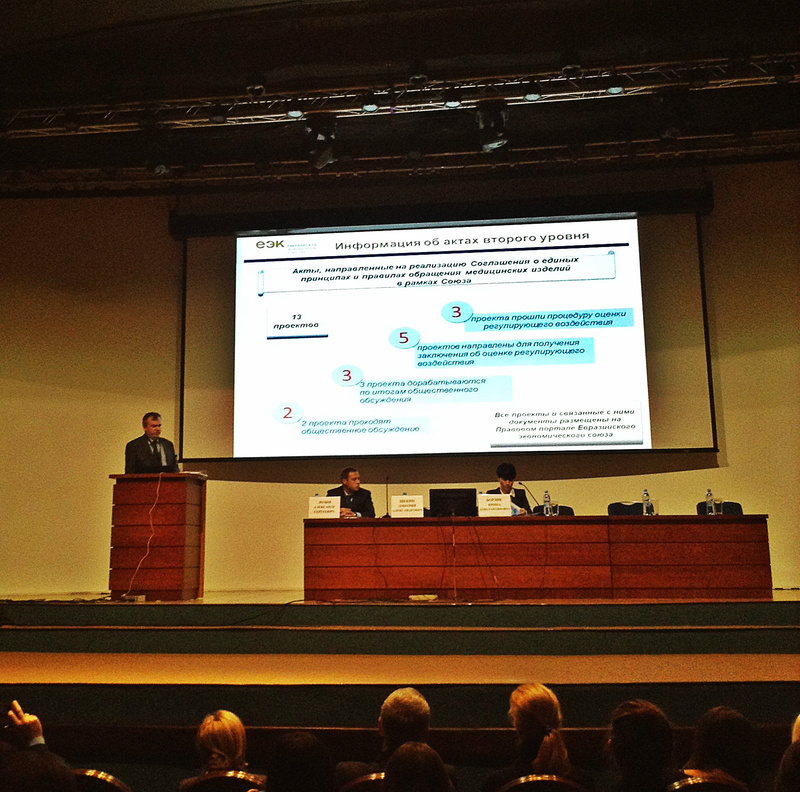 Eurasian medical device session of the National Annual Regulatory Conference. Less than two months remain until the enforcement of the Agreement on common principles and rules of the circulation of medical products of the Eurasian Economic Union. A special session of the Annual National Regulatory Conference, FarmMedObrashenie, was devoted to this topic on 19 October 2015, where a representative from the Eurasian Economic Commission made a report on the status of second-level regulations to this agreement. It was reported that no final regulations have yet been published and all documents (thirteen in total) are currently still in ‘a high state of readiness’. All drafts are available online. Possible changes ‘will be of an administrative nature’ only and the final regulations are stated to be enforced ‘in very similar editions’. Representatives from Roszdravnadzor (Russian medical device regulator) expect that ‘in order to avoid a repetition of the painful Russian experience of 2013’, with high probability during the transitional period imposed in chapter 11 of the Agreement, it will be possible to work on two parallel procedures: the local registration procedure of the country (effective today) and a new procedure of the Eurasian Union. Please see detailed Q&A on this topic in the separate post. The objective of this blog is to make Russian and Eurasian regulations clearer. Please post your comments and questions here or on the Russian medical device regulations Linkedin group You can also follow me on twitter @MedDevRus. Representatives from Roszdravnadzor (Russian medical device regulator) expect that ‘in order to avoid a repetition of the painful Russian experience of 2013’, with high probability during the transitional period imposed in chapter 11 of the Agreement, it will be possible to work on two parallel procedures: the local registration procedure of the country (effective today) and a new procedure of the Eurasian Union. Here there are five questions on Eurasian medical device integration answered by Roszdravnadzor. Question: If a medical device is registered in Russia today, will it be approved for whole Eurasian Economic Union after 1 January 2015? Answer: No. 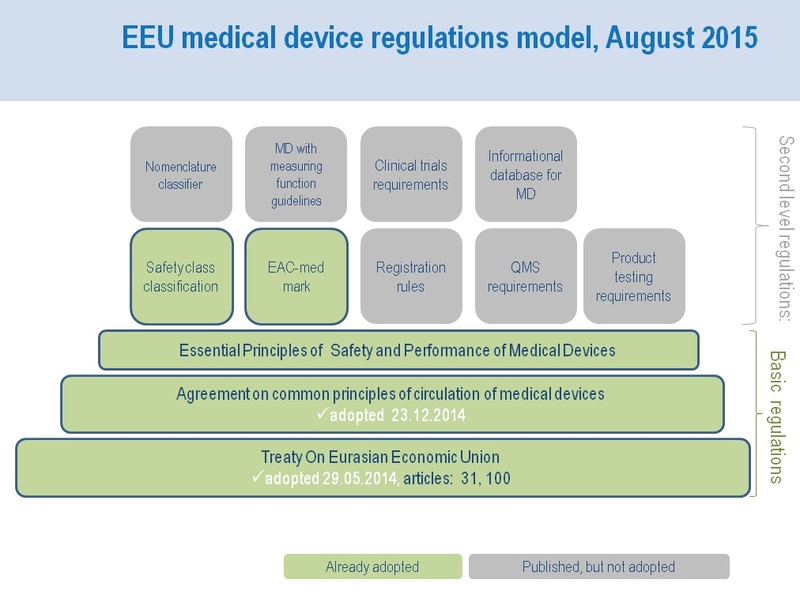 All medical devices approved in member states according to local procedures remain approved only in the country of registration. For approval in the whole of the Eurasian Economic Union, medical devices must pass through the new EEU registration procedure. Question: A registration file will be submitted 31 December 2015. Using which procedure will the medical device be registered? Answer: In this case, the medical device will be registered under the local registration procedure of the member state. Question: During the transition period, will the applicant have a right to choose which procedure to use (the new EEU procedure or the old local procedure)? Answer: Yes, during this period it is now expected that the applicant will able to choose between the procedures. Question: Will a medical device require the new EAC-med symbol for the EEU after 1 January 2016? Answer: The new EAC-med symbol will be required for medical devices approved under the new EEU registration process. Medical devices approved under local procedures of member states do not need the EAC-med symbol. Question: As was previously required, all Russian registration certificates must be replaced by 2017. Will enforcement of the new EEU regulations cancel this requirement? Answer: No, all Russian registrations with unlimited validity issued before 2013 must be replaced by 1 January 2017 under a special administrative procedure. Roszdravnadzor will continue these replacements in 2016.